At the end of every year and the start of every year the hot topic is New Year’s resolutions. Then a week or two after the New Year the hot topic is, have you failed or given up on your New Year’s resolution yet. The University of Scranton did research into New Year’s resolutions and found that just 8% of people that set New Year’s resolutions actually achieved them. So if so many people set goals… and fail, why should we set goals at all? Well, I believe if you set goals properly you cannot fail. I will explain what I mean at the end of the article. But first, here’s seven reasons why you should set goals to improve your golf game. 1st. When you’ve decided on a goal and written down that goal, it then gives your mind something to plan and work towards. And when you do that, the resources to help you achieve your goal will ‘almost magically’ appear at the right time to help you get to your goal. 2nd. Good goal setting can help you to achieve what may currently seem almost impossible… one small step at a time. If you’re on a 10 handicap and your goal is to become a scratch handicap golfer, then you’ll need to break that goal down into chunks so that you can build confidence and achieve sub goals along the way. 3rd. Goal setting helps you to improve long term. By setting goals and not reaching them, allows you to learn from your mistakes and improve. But by not setting any goals, what have you got to measure to see what you can learn? Goal setting is not so much about attaining your goals at any cost. It’s about having a target to work towards, seeing what is working and what isn’t, and adjusting until you either reach your goal, change your goal or ditch your goal and create some other goal. I don’t take the view that you should feel disappointed not to achieve a goal. You should only feel disappointed if you didn’t give 100% to achieve your goal – or if you didn’t even have a goal in the first place. But if you give 100% effort trying to achieve your goal and you don’t quite get there, it’s no big deal in my book. As the old saying goes, its more about the journey than the destination, and it’s not failure. The only failure is in not trying at all. And if you don’t quite reach your goal, chances are you’ll still be a lot further ahead from trying than if you hadn’t set the goal at all. 4th. Setting goals helps you to prioritize what you want from your golf game. Look, you could set a goal to be scratch golfer and find out that it’s going to take way too much time and commitment for you. That’s not admitting defeat. That’s just finding out what you really want and changing your goal. Or you might want to be a scratch golfer and figure out that you actually want to go further than that and you’re going to make an all out assault and try and turn pro. But if you don’t set a goal in the first place and work towards it then you will never really find out what you truly want out of your golf game. 5th. 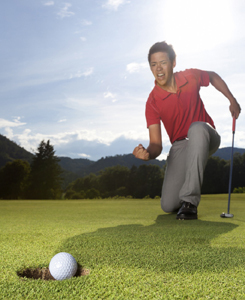 Setting goals for your golf game helps you to get the most enjoyment from playing golf. You will only get to play golf for a set period of time, so you should treat it like you would a vacation. When you go on vacation you plan what you want to do, where you want to go etc. Your golf game should be like that. You should work out the level of golf you want to play to, how you want to feel etc. Don’t leave it up to external influences to make you drift through your golfing life. You need to decide what you want and work towards achieving your goals. This is so you enjoy playing golf more and play golf with purpose and direction. 6th. Setting goals helps you to be efficient with your time. 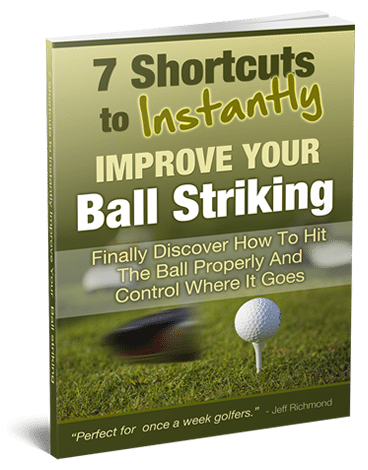 Most average golfers don’t have all day, every day to practice like a pro does. So if you want to improve your golf game you must focus your energies on what is important, so you can use your time wisely to help you get to your goals. But without setting goals you’ll just go around in circles and waste time, trying to achieve one random thought after another. One day it will be to improve your swing, the next it will be to become a better putter, the next it will be to hit longer drives. Setting goals will help you to hone in on what’s important in your game, so you can use your time wisely. 7th. Effective goal setting will help to build up your confidence. If you achieve one goal and then move on up to another goal, you’ll be in a good frame of mind to keep improving because you’ve tasted success already. Therefore you’ll be more likely to achieve the tougher second goal. Goal setting can be like building blocks for your confidence. Every goal achieved will boost your confidence and help you to achieve higher levels of success. So setting goals is very important. But you should never set goals that mean you’ll fail, in terms of quitting, giving up and not trying any more. You may need to adjust your goals, but there’s no quitting. The only failure with goal setting in my book is failing to try and achieve any goal. Next week I’m going to give you help and advice on how to set goals properly. And this advice obviously falls into the mental aspect of golf, which is hugely important. 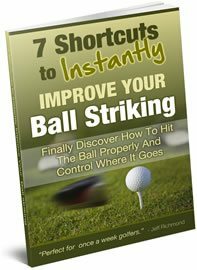 If the mental game is a weakness of yours and you want to make a focused effort to improve it, go here to get my step-by-step program that will help you to become a mentally tough golfer.